Jacek Kadaj | Fotolia. Today is National Strawberries And Cream Day, a classic English dessert. The ingredients are as simple as can be. And if you use just a dab of cream, whipped cream or fat-free sour cream, it’s also so healthful that it’s recommended by the Mayo Clinic (third recipe below). One cup of strawberries has just 55 calories, 0g fat or cholesterol, 3g dietary fiber and 7g natural fruit sugar. Strawberries are a very good source of dietary fiber, manganese and vitamin C, and are a good source of folate and potassium. *Our personal favorite is sour cream with a bit of brown sugar. 1. HULL, wash, dry and halve the strawberries. 2. SPRINKLE with a bit of superfine or table sugar, or noncaloric sweetener, unless the berries are perfectly sweet and need no additional help. 3. TOP with cream. Serve. Add a special touch to half and half or heavy cream. Before pouring it over the strawberries, add some rosewater, orange flower water, essence of jasmine or liqueur to your cream. Alternatively, you can infuse lavender in the cream two hours or overnight, and strain out the lavender before using the cream. Here are some flavored whipped cream recipes: bourbon, five spice, lavender, salted caramel and more. 1. MIX water and 1/2 of the sugar. Strawberry fields forever. Photo by Rachael Wong | Pics4Learning.com. 2. WHISK the half & half until bubbly. Add 1 tablespoon of sugar and the vanilla extract. 3. PLACE the strawberries into the bowl of sugar water. Soak for 5 minutes. Drain. 4. LAYER strawberries with cream in individual cups. 1. WHISK together the sour cream, brown sugar and liqueur in a small bowl. 2. 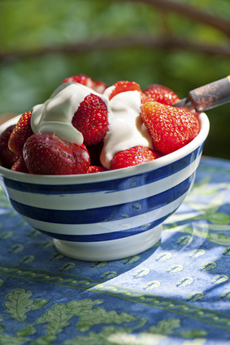 COMBINE the halved strawberries and sour cream mixture in a large bowl. Stir gently to mix. Cover and refrigerate until well chilled, about 1 hour. 3. SCOOP the strawberries into 6 colorful bowls or chilled sherbet glasses. Garnish with whole strawberries and serve immediately. 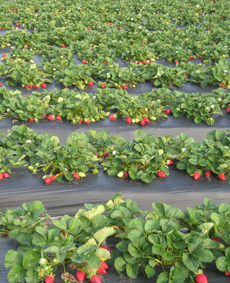 Strawberries do not reproduce with their seeds, but via long shoots of new growth. The strawberry is not a true berry, but what is known as an aggregate accessory fruit: The fleshy part is derived not from the plant’s ovaries but from the receptacle that holds the ovaries. Each “seed” (achene) on the outside of the fruit is actually one of the ovaries of the flower, with a seed inside it. The strawberry belongs to the botanical genus Fragraria, which is in the rose family, along with apples and plums. The name of the scientific classification was derived from the Old Latin word for fragrant. The garden strawberry is Fragaria × ananassa. The garden strawberry was first bred in Brittany, France, in the 1750s as a cross of Fragaria virginiana from eastern North America and Fragaria chiloensis, which was brought from Chilein 1714.